The EU is clearly not the only thing Theresa May is struggling to exit. 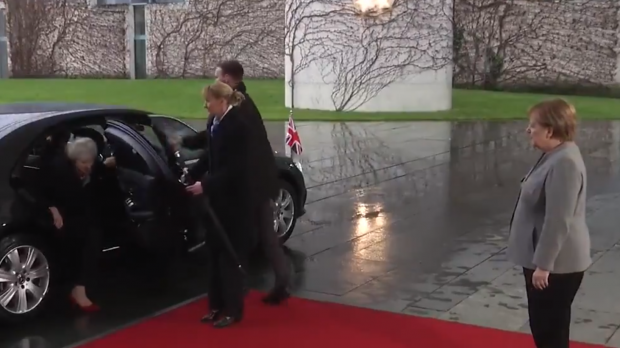 The British Prime Minister was briefly trapped in her car ahead of a meeting with German Chancellor Angela Merkel in Berlin on her floundering Brexit deal. An aide struggled with the locked door for a few seconds before May emerged for a red-carpet handshake with her counterpart. A day after pulling a parliamentary vote on the agreement in the face of hostility from lawmakers, May rushed from London for breakfast in The Hague with Dutch Prime Minister Mark Rutte and then a meeting in Berlin with Europe's most powerful leader Merkel in a frantic bid to save her deal. The EU has ruled out renegotiating the exit treaty.